This is a way of getting the guests involved in the ceremony. They are asked to hold the rings for a moment, warm them with their love and attach their wishes for the health and happiness for the couple. This takes place while the ceremony goes on and a person can be put in charge of it (Lord of the Rings?). If the number of guests is very large, the ring warming can be confined to the first few rows. The rings would be in a box, a little bag or attached to a cushion or similar. This is a romantic notion which appeals to some people, but not all. Each of the couple writes a letter to each other the night before the ceremony and don’t show it to each other. At the ceremony there is a box containing a bottle of wine or other celebratory beverage. The couple put the letter into the box and it is sealed and not opened until the first (or other) anniversary when the couple toast the anniversary and read what they were thinking about each other the night before they were married. The symbolism attached to the sand ceremony is that the couple and their families are coming together. You will need one larger empty container (all sorts of fancy containers are available on line) and smaller containers of sand. Each one of the couple pours sand into the larger container symbolizing their new unity and the celebrant says some meaningful words to accompany this. If there are children, extra containers of sand can be used – again symbolizing the unity of the family. Coloured sand can be used or sand from different beaches which have meaning for the couple. This has the same symbolism as the sand ceremony – the coming together of the couple and their respective families. Three candles are used – two smaller ones and a larger one. A family member of each of the couple (maybe the mothers) comes and lights the two smaller candles. Later on in the ceremony when the vows have been made, both bride and groom take the flames from these candles and light the larger candle. 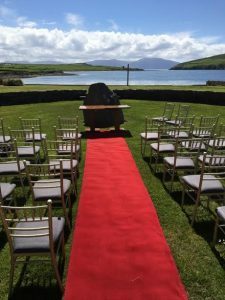 This is an adaptation of an old tradition in Ireland where the groom presented the bride with a coin suggesting that he would be supporting her financially in the future. Modern couples exchange coins as a symbol of their mutual support for each other and the family from now on. When the couple have signed the Marriage Registration Form, they exchange a small gift (perhaps a single rose) as their first gift to each other as married people. The gift is simple but conveys the love that each feel for each other now, and the promise of that for the future. Hand-fasting or binding is an adaption of what is said to be an ancient Celtic custom when the couple’s hands were bound together as a symbol of their unity as husband and wife. The binding is done with a ribbon, sash or ‘crios’ or something which has sentimental meaning for the couple, is accompanied by a hand blessing spoken by the celebrant, and some music if desired. For many people, music is an integral part of a ceremony, but, of course, some people may choose not to have any. The music can be live or recorded and the range of suitable music is very wide. Many people choose pieces or songs which have special meaning for them and family members often contribute either instrumental music or songs. The number of pieces is a matter of choice, but the most common practice is to have music when the wedding party comes in, music while the Marriage Registration Form is being signed and when the couple are walking out. There is plenty of scope for additions here. As a humanist, for me the ceremony is secular, so sacred music is not appropriate. Readings, like the other elements I have been discussing are totally a matter of choice. There is no prescribed number – some people have none and some have five or six. The reading can be poetry or prose – written specially for weddings or something which has meaning for the couple. Some readers write an original piece with a message for the bride and groom and if there are children in the family, they might like to write a poem for the occasion. As with the music, I don’t have prayers or psalms in the ceremonies I conduct. Other elements you may consider. Here are some other things which have been included in ceremonies and which you might like to consider. You may plant a tree in a pot to commemorate the day and this will last well into the future. Some couples like to make a presentation to their parents to thank them for helping make them the people they have grown into. If the couple has a child, sometimes they give him/her a present as a memento of the day. A pendant or a bracelet might be suitable.